Nyal served as Chief Engineer at ADMMR and became Chief of the Economic Geology section at AZGS. 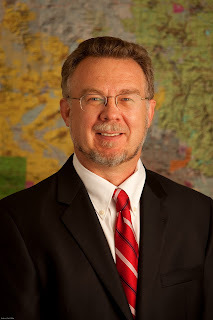 He is universally known across Arizona and beyond, as the "go-to" guy to find out what's happening and what's happened in mining and mineral resources in Arizona. Miners and would-be miners know that if you are exploring or developing mineral resources in Arizona, you want to check in with Nyal first to find what information already exists. Nyal timed his retirement with the closure of the AZGS Phoenix office as part of the transfer of duties to the University of Arizona. Nyal is already promising to come back as a volunteer to help move the massive mineral files and library to storage at the old mining and mineral museum near the Capitol in order to preserve them. For the past 6 months, Nyal also assumed the temporary duties of Oil & Gas Administrator, supporting the Arizona Oil & Gas Conservation Commission. Those duties are being transferred to the Dept. of Environmental Quality as of July 1. Congratulations Nyal, we are going to miss your insight. Nyal - You will be missed. You were such a valuable resource of information for mining and mineral resources and general geology. You were pleasantly and enthusiastically resourceful. I, and many others, will miss working with you. We wish you a meaningful and good retirement. It was very pleasant meeting you for the first time in March of this year. We, again, thank you for the hospitality you showed us when we visited your home. Our best wishes in your retirement years; although I suspect you will be busier than ever before. All the best in your retirement years. We suspect that you will be busier than ever before. Once again, thanks for your hospitality during our visit last March.